Today’s Monkey Cage blog features the first publication of survey data based research on geopolitical attitudes among ordinary citizens in southeast 6 Ukraine and Crimea. This research was funded by a RAPID grant from the Political Science division of the National Science Foundation. Our initial proposal had to be modified because of the outbreak of fighting in the far eastern oblasts of Donetsk and Luhansk in April 2014. The survey research was administered in 6 southeastern oblasts (excluding Donetsk and Luhansk) in December 2014 by the Kiev International Institute of Sociology (KIIS) while the Levada Center conducted the research in Crimea. We wish to acknowledge the professionalism and independent integrity of both organizations in helping us realize this social scientific and academic research driven project. 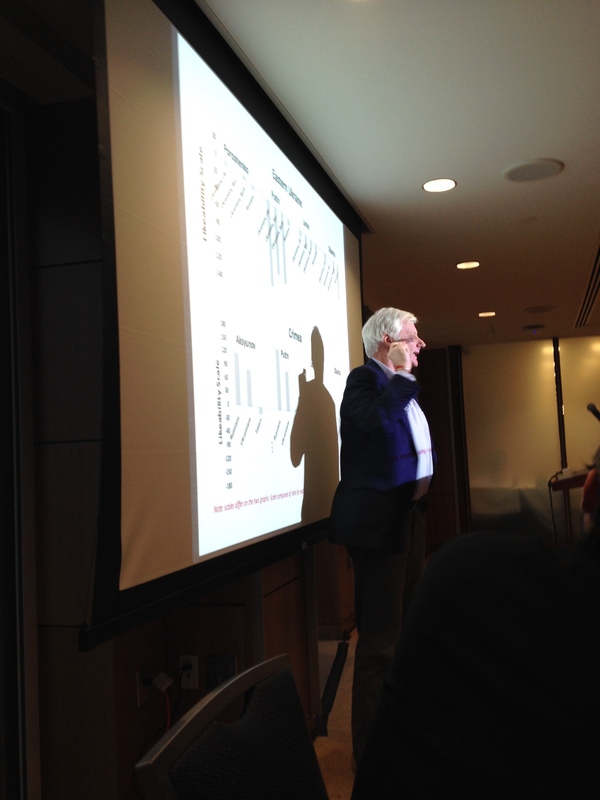 Yesterday John O’Loughlin (pictured) and I presented the data that is in today’s Monkey Cage blog at an event organized by the Director of Institute for European, Russian and Eurasian Studies (IERES) at George Washington University, Dr Henry Hale. 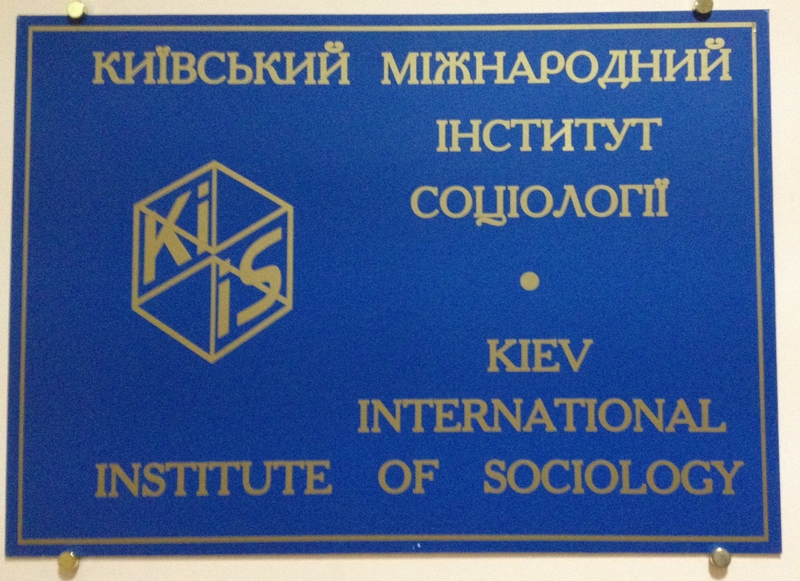 He and a team of fellow academics also used KIIS for a three part panel survey on Ukrainian elections, the Euromaidan protests, and security perceptions in 2014. Part of that team, Dr Olga Onuch from the University of Manchester and Dr Nadiya Kravets from the Harvard Ukrainian Research Institute, were in attendance as were a number of other researchers engaged in ongoing work in Ukraine. Unfortunately bad weather prevented Dr Erik Herron from attending but an article on his 2014 research on the Ukrainian electoral administration system is published, along with lots of other interesting articles, in a special edition on Ukraine’s crisis in Eurasian Geography and Economics. ‘Southeast 6 Ukraine’ is an awkward geographic designator but it is the most accurate as we are not surveying all of ‘Eastern Ukraine’ or ‘Southeast Ukraine.’ The Monkey Cage blog piece appeared with graphs that had the title ‘Eastern Ukraine’ but this should be understood as Southeast 6 Ukraine and not areas beyond those surveyed. This issue came up yesterday in questions where someone asked what our bottom line conclusions are about “Eastern Ukraine” and Crimea. Our answer was to stress how Ukraine is made up of very distinct geographic regions. Crimea is very clearly different from the territory to its north: it is a place apart. In a very different way, so also is the Donbas(s), Donetsk and Luhansk. There is no homogenous ‘Eastern Ukraine’ or ‘Southeastern Ukraine’ but a quilt of very different places. Our survey considers two but is unable to make any observations about the Donbas(s). This entry was posted in Public Opinion, Research, Ukraine and tagged academic research. Bookmark the permalink.